How do they compare to the Amazon Kindle? Sony officially announced its two new ebooks for the UK market this week – the next-gen Pocket and Touch editions of the Reader. 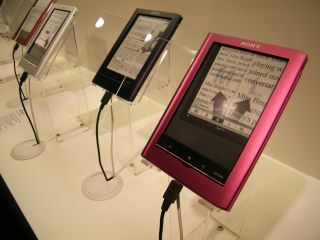 Although they were initially announced at IFA 2010, this is the first time the devices have been seen in the UK, with Sony announcing that they have secured access to more books than any other ebook reader on the market – a whopping 600,000. This is due to a rental agreement with 50 British Libraries and access to Google's vast archive of free ebooks. Although Sony wouldn't give out details on price for the Sony Pocket and Touch, Waterstones has announced UK pricing for both devices. Both of these are currently on pre-order with the UK release date for both the Touch and Pocket pencilled in for 17 September. These are far pricier than the Amazon Kindle, which will cost you £109 (or £149 with Wi-Fi). But Sony is hoping that its all-new touchscreen Touch and the fact the devices are not tied to just the Amazon store will entice tech-savvy bookworms.